Last week we received positive readings for some key economic indicators. But I still see plenty to worry about. 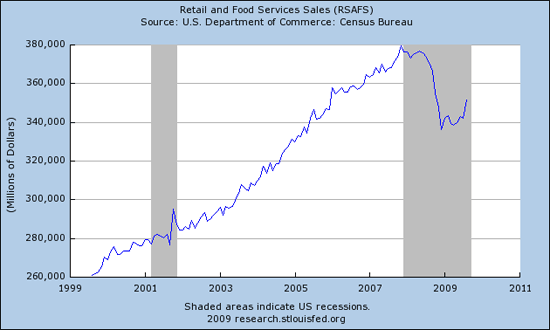 after a string of contractions, these data suggest that consumer demand is, at a minimum, stabilizing. Core retail sales may even be starting to firm slightly (up in 2 of the past 3 months), but we will need to see another month or two of positive data to have confidence in that view. On Wednesday the Federal Reserve reported that its index of U.S. industrial production grew by 0.8% in August, adding to the 1% gain seen in July, and breaking the steady drop this indicator had been exhibiting since January 2008. 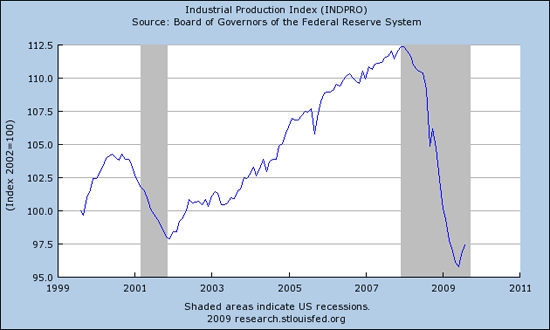 Spencer of Angry Bear notes that the increase in industrial production over the last two months is typical for previous economic recoveries. If this does prove to be a typical recovery, given the sharpness of the downturn we would expect to see sharp growth from here. 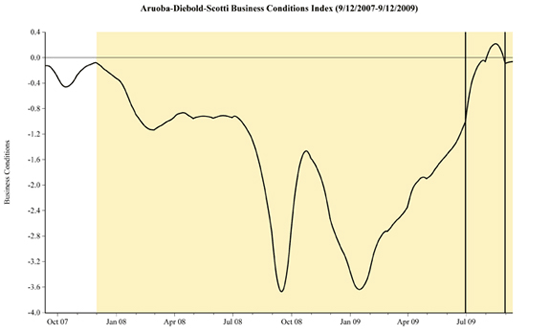 These new readings for sales and production were enough to push the Aruoba-Diebold-Scotti Business Conditions Index back into positive territory for the first time since the recession began. What’s not to like? 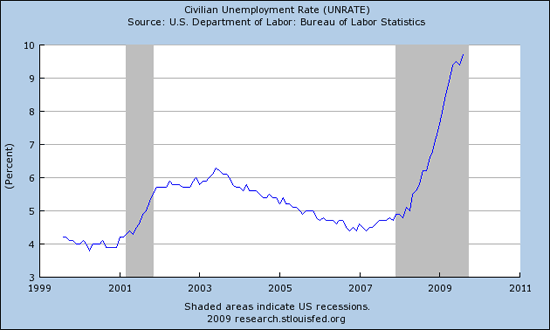 My key worry about the U.S. economy remains the employment picture. 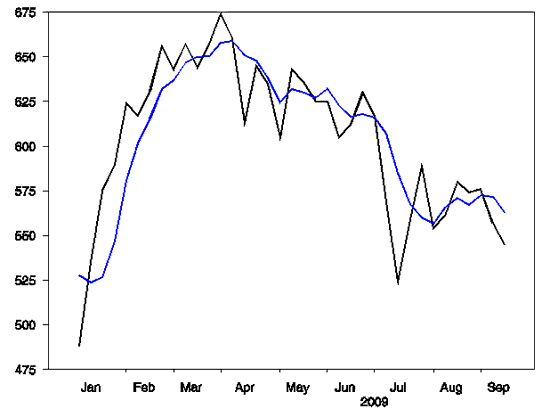 The Conference Board includes initial claims for unemployment insurance and average weekly manufacturing hours in its index of leading economic indicators, the number of workers employed on nonfarm payrolls in its index of coincident economic indicators, and average duration of unemployment in its index of lagging economic indicators. 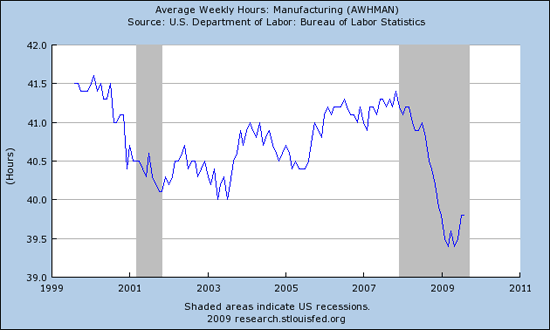 Manufacturing hours have indeed rebounded off their lows. But for total private industry jobs, we’ve been stuck at 33.1 hours/week since March, unless you want to claim victory on the basis of the brief nadir of 33.0 hours/week touched in June. New claims for unemployment insurance did fall this spring. But the 4-week average reported Thursday is actually worse than the numbers we were seeing at the end of July. Seasonally adjusted weekly new claims for unemployment insurance (black line) and 4-week average (blue line) so far this year. Bill McBride believes that as long as the number of new claims remains above 400,000 per week, the total number of Americans working is going to continue to fall. With the latest 4-week average for new claims at 563,000, we’ve got a long way to go before the employment situation is actually improving. And even once the number of Americans working starts to grow, unless it grows faster than the number looking for work as a consequence of population growth, the unemployment rate will continue to climb. I see this as more than the conventional hand-wringing about a “jobless recovery.” That phrase might suggest that we’re just talking about a replay of the anemic recovery that followed the 2001 recession. 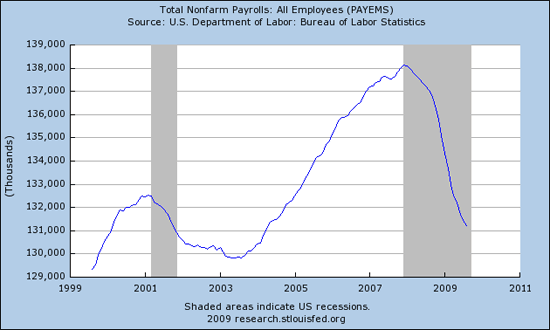 In the first 6 months of 2002, nonfarm payrolls fell by 350,000, or 58,000 per month. 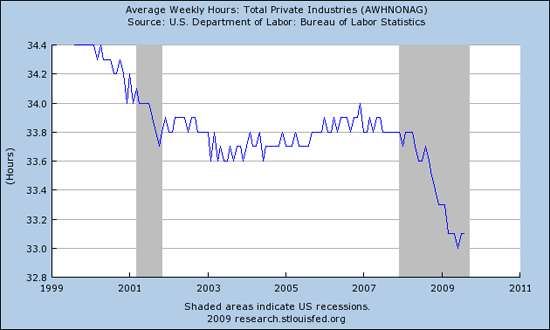 In July and August of 2009, payrolls fell by 492,000. 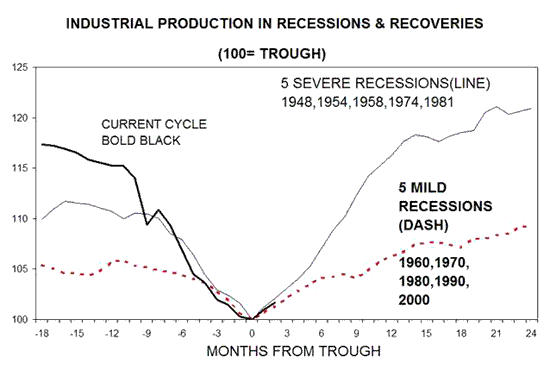 If the recession really ended in June, as some claim, this is a much more serious problem than we saw in 2002-2003. The financial system has improved but is not yet back to normal. It still holds hazards that could derail a fragile recovery…. And the likelihood of continuing losses by financial institutions will add new fuel to the credit crunch. In particular, small and medium-size banks could experience damaging losses on commercial real estate loans. Thus far, the largest losses have been on loans for construction and land development. Going forward, however, rising loan losses on other commercial real estate lending is likely because property values are falling, office vacancy rates are rising, and credit remains tight or nonexistent for those many property owners that will need to refinance mortgages over the next few years. Financial contagion from this sector is one of the most important threats to recovery. So yes, it was a good week for some key economic indicators. But serious concerns remain.